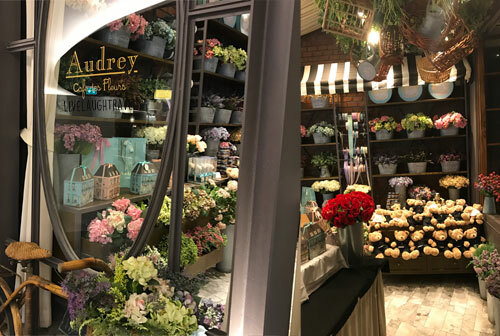 The Audrey Café in Bangkok is inspired by Audrey Hepburn, thus you can only imagine the shop exuding classy elegance in all directions when you enter any of its outlets. Our Travel Blog visited the Audrey des Fleurs Cafe at Bangkok’s EmQuartier, where its layout is a unique French Provincial inspired décor (think Beauty and the Beast), and their exclusive desserts are inspired by the elements of the flowers and from the name itself you can pretty much guess the extent and effort in details they have put in to this café. 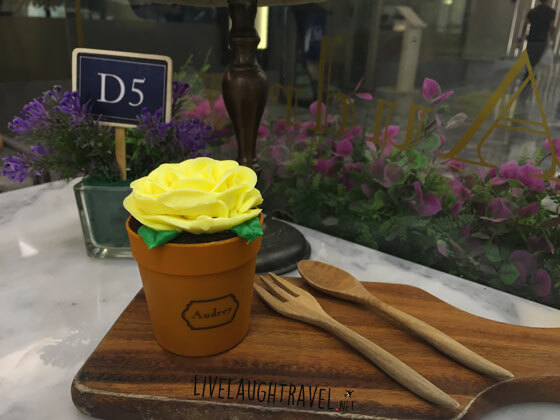 They do have various cafes and outlets all around Bangkok, but only this particular outlet at EmQuartier serves flower inspired desserts! 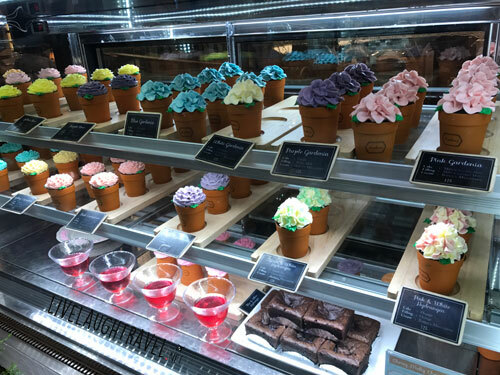 While you make your way up to the 8th level in the Helix Quartier and find your way to the shop, you’ll be pleasantly greeted with a myriad of absolutely beautiful flower pot cakes that are encased behind a glass fridge. The intricate details of this flower pot cakes will definitely stop by-passers in their tracks even if it’s just to take a second look. The flower pots comes in different types and colors but they are all so pretty you would want to try every single one of them. They are mainly Rose, Gardenia, Hydrangea or Carnation, with different colors, and they all represent different flavors. As we made our way into the shop, we literally felt like we were entering a flower shop instead of a cafe (There is an actual florist at the entrance to the shop too!). The interior was amazing and their attention to details was astounding. We couldn’t take our eyes off all the beautiful cakes and décor in the shop. There are 2 sets of menu; 1 for the standard usual meal menu and a different set of menu for dessert. Being a sucker for adorable food, we ditched the food menu and went straight for the desserts menu. We ordered 3 of their specialty flower pot cakes, a slice of Milo crepe cake plus Thai milk tea crepe cake! The different types of flowers may have different types of finishing thus accommodating to their different flavors and color. (ie. Buttercream or cream cheese, etc). If you look at the menu, you’ll be amazed at how they are able to make the crowd favorite mango sticky rice into a beautiful mango rose dish that will make it so heartbreaking to eat! Even the utmost effort is put into their drink creation! But as our Singapore food blog always say, despite it’s presentation, it does still boil down to the taste of the food. Unfortunately thou, as much as we love the décor and attention to details on all aspects of the food art, it really is just like any ordinary cake and its taste did not exactly blow us away. 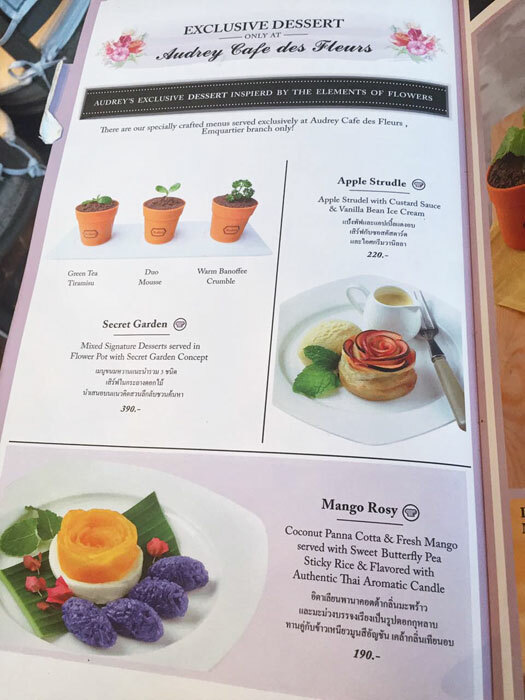 But we would give major credits to the ingenious flavors of the flower pot cake and the effort they put into creating the different types of flower inspired dishes in its menu. The crepe cakes on the other hand (especially the Milo Crepe), didn’t look overly fancy but deserves a special mention for the sweet tooths out there. Regardless of what they say, girls love flowers. A stalk or a whole bouquet, they love them, and that’s why we always see flowers at weddings. But it’s pretty sad how we would spend so much on flowers only to have them die a few days after. These flowers however, are not only cheaper, but can also be eaten. 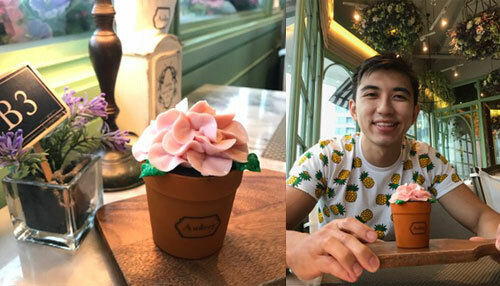 Bangkok’s Audrey flower pot cafe @ EmQuartier is definitely worth a trip down even if it’s just to take a shot with these IG worthy flower pot cakes! Plus points if your partner is a sucker for flowers or pretty things. Combine a trip to Audrey with the Bangkok’s Most romantic spot and Thailand would no longer just be a shopping holiday for you guys.